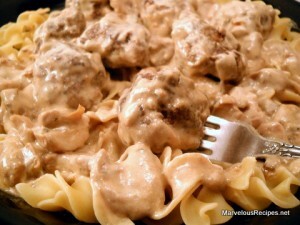 Serve these savory and flavorful meatballs over hot cooked noodles for an awesome dinner your family will rave about! 1. Combine the bread and milk in a large bowl. Add the egg, onion, salt and pepper. Crumble the ground beef over the mixture and mix together well. 2. Shape into 1-inch balls. In a large skillet over medium heat, brown meatballs in small batches until meat is no longer pink; drain on paper towels. 3. In a large saucepan, melt the butter or margarine; stir in flour until smooth. Gradually add the consommé and bring to a boil. Cook and stir until thickened; about 2 minutes. 4. Reduce heat; add mushrooms, parsley flakes, Worcestershire sauce, bouillon and meatballs. Simmer, uncovered, for 30 minutes, stirring occasionally. 5. Remove from the heat and stir in sour cream; sprinkle with fresh minced parsley. Serve over hot cooked noodles. Makes 6 to 8 servings.